The art museums of Boston have the reputation for being among the best in North America. With round trip airfares at all time lows and tickets easy to book, a friend and I recently made the pilgrimage to the original "city on a hill". We set aside most of Saturday and Sunday afternoons to "do" three famous institutions: the Museum of Fine Arts, the Isabella Stewart Gardner Museum and the Harvard University Art Museums in Cambridge. Boston's Logan Airport is so close to the downtown core that we took the subway rather than a cab. In less than twenty minutes we were at Park Station at the edge of Boston Common. Our hotel, the Omni Parker House, was right across from the station. The Parker House was one of the first great hotels of the 19th century. Celebrities such as Charles Dickens stayed here. Well into the 20th century, it was the place to stay in Boston. John F. Kennedy took the time to propose to Jackie while they were at this distinguished location. The hotel has been restored to its former elegance, now combining a writing desk and colonial style furniture in the rooms with high-speed Internet. This is a city made for walking, especially on a perfect late summer weekend, so we decided to stroll through Boston Common. With its winding paths, public gardens and waterways, the Common is an unalloyed delight. For this traveler it was an eye opening introduction to the "emerald necklace" of green spaces throughout the city. Our first destination, the Museum of Fine Arts is located in the Fenway District which is also part of the necklace. The museum also has its own subway stop, so central an institution is it to the life of this great city. Like so many other art museums founded in the 19th century, the MFA is housed in a neoclassical building. Much less imposing than the Philadelphia Museum of Art or the National Gallery of Art, it is nevertheless surprisingly spacious and impressive once one is inside. The great staircase adorned with ceiling murals of mythological gods and heroes by John Singer Sargent sets the tone. This is an institution dedicated to protecting art. The museum's West Wing , designed by I.M. Pei in 1980, is organized along a 200-foot-long barrel-vaulted galleria, which serves as a skylight indoor court, and is the physical and visual focus of the museum's public spaces including one of the best-stocked bookstores specializing in fine art that I have ever visited. Don't miss David Hockney's Garroway Hill at the entrance to the cafe/bookstore. The MFA is particularly rich in American painting and in French art from the 19th century. All the big names in art are here, represented by some of their most distinguished works. For instance, three artists rarely seen outside Europe are represented by superb pieces: Duccio's Crucifixion , Rogier van der Weyden's Saint Luke Drawing the Virgin , and Carlo Crivelli's Lamentation . Every major museum has a Rembrandt but MFA has Artist in His Studio an early work that announces that a new master has entered the world of art. The thirty-eight works by Claude Monet make this the largest collection of his work outside of the Musée d'Orsay in Paris. Most of these were on loan to the Bellagio Hotel in Las Vegas when we were there, so do check before you go if you're into Monet. Nonetheless there were quite enough Monets on display for those of my taste. What I liked about the impressionist and post impressionist collections is that they contain more than eye candy. There are daring and challenging works by J.M.W. Turner, Manet and Gauguin. 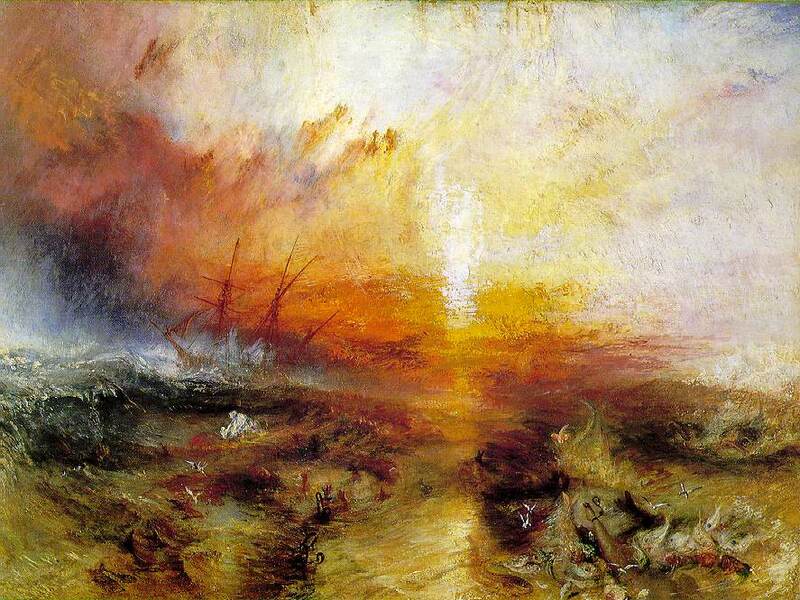 In the large 19th-century European gallery, one's eye is captured by the lurid colors and churning brushstrokes of Turner's horrific Slave Ship . One of his most tragic pictures, it finds an especially appropriate home in this city, Boston being the center of ante-bellum abolitionism and many subsequent progressive causes. From the radical father of impressionism, Edouard Manet, we have a radical political work in the form of his famous The Execution of the Emperor Maximilian . Also Paul Gauguin asking the deepest questions in his Where Do We Come From? What Are We? Where Are We Going? And then the high serious of modern art gives way to the most romantic of Renoir's works, The Dance at Bougival . The galleries devoted to the history of American painting are very strong in portraits and landscapes. I was amazed to see a huge room devoted to the portraits of John Singleton Copley. The MFA owns sixty of his portraits, as well as forty by Gilbert Stuart. Many of Sargent's best portraits are here including The Daughters of Edward Darley Boit . Between the halls containing these giants are galleries filled with the artists of the Hudson River School, as well as superb pieces by Winslow Homer and Mary Cassatt. For all this one should not leave the impression that this museum is devoted only to European and American art. There are also distinguished collections of Japanese, Chinese and Greek art, as well as works from Africa, Oceania and the pre-Columbian America. One of the largest collections of ancient Egyptian art outside that country is here. And again it's the quality and quantity that make MFA so amazing. King Menkaure (Mycerinus) and his queen . Despite its huge size this has to be one of the most intimate works in the museum. Satisfied and even stupefied by all this art we decided to call it a day at MFA. We crawled back to our hotel, took a nap and then went back out to do a walking tour of Beacon Hill led by one of the tour guides of Boston by Foot. In this neighborhood where Boston's elite has lived for two centuries we made a beginning at the famous old State House designed by Charles Bullfinch, and then worked our way through some of the private homes, which he also designed. On our way we passed Senator John Kerry's townhouse in Louisburg Square but as a result of the Senator being at home that weekend the police quickly moved us along. We finally ended our walk where we began, but this time with our backs to the State House and facing Augustus Saint-Gaudens' famous memorial to Col. Shaw and his regiment. Later that evening we followed the Freedom Trail to Fanueil Hall and dined at the oldest restaurant in America, the Union Oyster House. No one should visit Boston without sampling its fresh fish. We were not disappointed by the high quality of the halibut, scrod and haddock served simply here or by New England's favorite deserts Indian pudding and Apple Cobbler. On the way out we noticed an unusual series of glass towers rising in front of us with smoke coming out of the ground. Once inside we realized that we were looking at the New England Holocaust Memorial. Sunday morning we made our way back to the Fenway, or "the Fens", as the locals are wont to say, to find the Isabella Stewart Gardner Museum. This is one of those rare institutions that forever bears the impress of the single individual responsible for its creation. John Singer Sargent's portrait of Gardner is therefore a good place to begin one's tour. The artist truthfully conveys the force of nature she was: a woman able to hold her own in the highly competitive ultra macho world of art acquisition at the turn of the 20th century, a world were all the other players were super millionaire merchants and industrialists. Gardner loved Venice so much that when she came to build her museum she created an indoor courtyard in the brilliant style of that city, with a sculpture garden and open skylight. This innovation makes even the dreariest winter day in Boston into something redolent of the Mediterranean. Gardner sponsored the young Bernard Berenson before he became the éminence grise of Italian Renaissance art. He returned the favor by alerting her before great treasures were to come on the market. To list the artists whose works she acquired through him is to string pearls: Giotto, Fra Angelico and Masaccio. Best of all there is the grandest Titian in America, The Abduction of Europa , and a Hercules by Piero della Francesca, from the artist's Arezzo studio in Tuscany. The museum is bound by the terms of her will not to loan out pieces or to even change their location. Consequently anything you see here will not be seen elsewhere. As a result of this "no change" legacy the visitor to the Gardner sees things exactly as Mrs. Jack intended for them to be. In the Dutch Masters room there are even empty canvases where several Rembrandts and a Vermeer were stolen in the early 1990's. Give yourself about 90 minutes to do this museum and then treat yourself to lunch in the garden cafe, which serves smart seasonal dishes and insidiously good desserts. Just across the Charles River are the museums at Harvard Square in Cambridge, our final destination. Harvard is easily reachable through Boston's excellent subway system. This is a more bohemian part of the city and is home to many well-stocked bookstores and cafes and filled with college students. The Harvard Art Museums are a bit hidden in the center of the campus on Quincy Street. Harvard is oldest and richest such institution in the country, and its museums are the Busch-Reisinger Museum (German Expressionism and Bauhaus), the Arthur Sackler Museum (Asian, Ancient Egyptian, Indian and Greek) and the Fogg Art Museum. The Fogg is a neo-Georgian building, which contains another interior courtyard modeled on a fifteenth century Italian palazzo. This one is made of travertine with an opaque glass ceiling. In startling contrast to the Gardner, the austere bleached white walls and high empty spaces of the Fogg seemed rather formidable. High minded, severe, and quite definitely cloister-like this space announces you are here to be educated. The first floor has an impressive collection of large medieval, renaissance and northern European devotional paintings. There are few of the Madonnas and nativities that Mrs. Gardner loved. Rather these galleries are filled with the tough side of Christian art: flagellations, crucifixions, depositions and last judgments. The heroes of the spirit - Saints John, Jerome and Francis - share space with condottoris and mythological men beloved during the Renaissance. There is a rich collection of French art of the 19th and 20th century on the second floor and French art means females nudes. 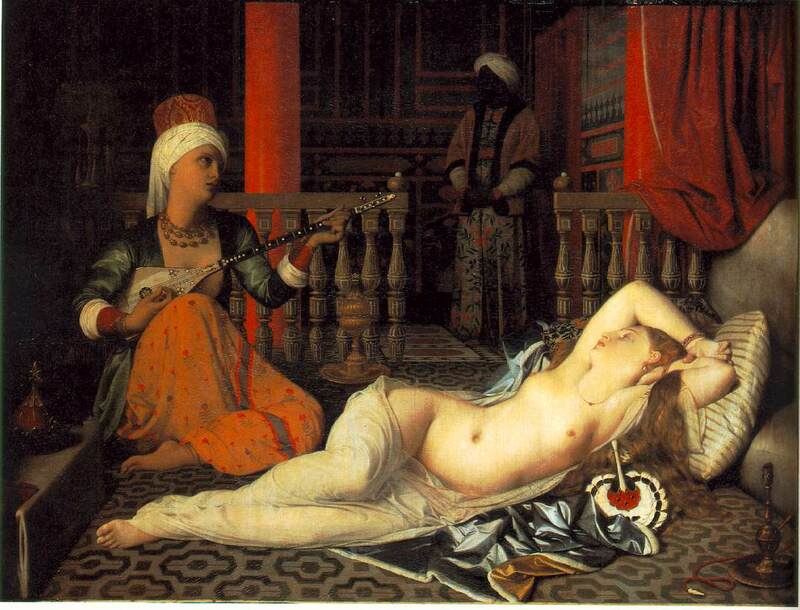 Ingres' famous Odalisque with a Slave is here, as well as one of Renoir's most voluptuous women . Famous works like Monet's Gare St. Lazare , and Vincent van Gogh's 1888 Self Portrait as a Buddhist Monk are alone worth the trip into Cambridge. But most appealing to me was Edgar Degas' The Cotton Dealers of New Orleans . You can almost feel the sponginess of the cotton he has placed in that picture. How do you know when you have seen enough? With that unexpected Degas picture, I decided my pursuit of paintings in Boston was finished. My companion and I had met our goal of seeing many of the best things we had read about in the guidebooks. This left us the remainder of the afternoon to relax and enjoy Harvard Square's shopping. Later that night we explored restaurants in the Italian North End. Mark Twain once remarked: In New York they ask, "How much is he worth?" In Philadelphia, "Who were his parents?" And in Boston they ask, "How much does he know?" Given the collections on display in the art galleries of Boston, Twain's characterization seems very fair, at least as far as the collectors, curators and connoisseurs of the city's museums are concerned. Do take a look at each museum's website before visiting, not only for basic information but also for tours, layouts, and highlights. The Museum of Fine Arts website has an online guide to the collection , as well as a one-hour virtual tour , and a database of 50,000 works .